Munitions ships carried ammunition to forward fleet bases. Naturally this was hazardous duty, as a ship loaded with a few thousand tons of munitions had roughly the same explosive potential as a tactical nuclear weapon. Yet munitions ships were required to come clear into the combat zone during the Marianas campaign, with splendid disregard for the hazards involved, due to the unexpected length of the campaign. Eventually an LSD and a number of LSTs and Victory Ships were pressed into munitions transport duty. Fortunately for the Allies, none were hit by the Japanese. The United States Navy experienced two disasters with munitions ships during the course of the war in the Pacific. The first occurred at Pearl Harbor on 21 May 1944, when LST-353, which was being used as an improvised munitions ship, exploded and took most of the small ships in the West Loch with it. Six LSTs and three LCTs were lost and 163 sailors killed and 396 injured. The other occurred in the fall of 1944, when the Mt. Hood exploded in Seeadler Harbor and took two other ships with it. The British suffered a similar disaster at Bombay on 14 April 1944, when the merchant ship Fort Stikine (7142 tons) caught fire while loaded with munitions and exploded. Official casualties were 336 killed and 1040 injured, but eighteen merchant ships and three Indian Navy warships were destroyed or heavily damaged and two docks, half of the municipal grain stores, and much of the city were burned out. A kamikaze strike on Lewis L. Dyche off Mindoro on 4 January 1945 set off its cargo of munitions, destroying the ship and killing the entire crew, but damage beyond the ship was limited to a single sailor on a nearby ship killed by flying debris. Munitions ships followed strict safety procedures to reduce the risk of catastrophe. These included safe handling procedures and the stowage of different kinds of munitions in different holds of the ship. Other procedures were designed to reduce the risk of static discharge. Safety could be improved considerably by careful manufacture of the munitions to reduce their sensitivity to shock and fire. 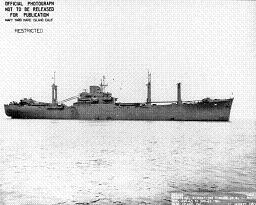 By analogy with underway refueling, munitions ships began conducting underway replenishment of ammunition in early 1945. The methods used were worked out by Captain Burton Biggs of Spruance's logistics staff in December 1944, and was first done operationally on 23 February 1945, during the Iwo Jima campaign.